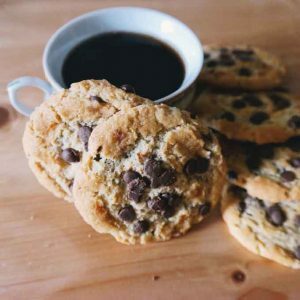 Cream Cheese Chocolate Chip Cookies | Relish! Ok people, these Cream Cheese Chocolate Chip Cookies are the best that you’ll try! Beat together the butter, sugar, brown sugar, and Philadelphia cream cheese in the bowl of a stand mixer. Mix together the flour, baking soda, and salt in a separate bowl. Add gradually to the stand mixer, scraping down the sides of the bowl as it mixed. Mix in the chocolate chips with a wooden spoon. Scoop by rounded tablespoons onto parchment or silicon lined baking sheets. Bake at 350 for 9 to 10 minutes, until the edges look set. Let cool on baking sheet for a few minutes before moving to wire rack.